The Darksiders video game series was always well-suited to be a tetralogy, one game for each of the four Horsemen of the Apocalypse. However, developer Vigil Games’ closure in 2013 put the series’ future into limbo. Now, eight years after its debut, Gunfire Games, staffed by a number of former Vigil employees, is quite literally picking up the reins and continuing the tale of the Horsemen, following the mage Fury in Darksiders III. While the creative team involved definitely includes the right pedigree, and the game, as a whole, feels like a seamless fit into the established universe, not every design decision this time translates into higher levels of quality. A few lackluster elements and a half-step away from the series’ Metroidvania trappings result in a good, if not great, action RPG that will still please players who aren’t looking for cutting-edge innovation. Compared to the previous two entries, the plot of Darksiders III is much more straightforward. The Charred Council assigns Fury the task of hunting down the Seven Deadly Sins, who have been released onto an Earth recently caught in the war between heaven and hell. As such, Darksiders III‘s events act as a sort of prequel to the first game, taking place while War is in chains for his supposed crimes, and concurrently with Death’s mission to clear his brother’s name from the second installment. A few pointers are given to establish the game’s timeline — humanity has not been fully eradicated yet, for example, and Fury occasionally runs across solitary survivors — but ultimately the game works as a standalone story for Fury’s mission. The convoluted piecemeal breakdown of the previous games’ events has also been streamlined. Whereas earlier entries frequently interrupted the path to the Horseman’s goal with smaller obstacles which themselves would often be broken down into tinier objectives. Here, Fury sets out to slay the Deadly Seven from the very beginning, and, one by one, this is exactly what she does, with little to no deviation. There are a few plot revelations and surprises along the way, but the overall experience feels much more to the point. The drawback to this is that there is less of a sense of anticipation and variety as objective checkboxes are ticked off the list; it’s fairly easy to predict a straight shot from start to finish from the time the game begins. The Darksiders franchise, despite being fairly action-oriented, has always taken a good amount of inspiration from the classic Zelda and Metroidvania structure, granting players frequent reasons to backtrack with freshly-acquired powers and access new areas. Darksiders III tones this element of gameplay down, though it is still present, and instead favors other systems more in line with a Soulsborne title. Slaying enemies grants Fury lurchers, the game’s equivalent of souls, that she can offer to the returned demon-merchant Vulgrim in exchange for attribute points to raise either her health, strength, or arcane damage output during retaliation strikes. Falling in battle means all carried souls are dropped, though they remain at the same location and persist even through further deaths, so this element effectively seems unnecessary. Weapons can also be upgraded by visiting Ulthain the Maker, familiar to players of the first game, using crafting materials found around the world. Healing is also done via items, particularly the Nephilim’s Respite item, similar to an Estus Flask, that can be used at any time and is replenished via special green souls dropped randomly by enemies. The game does still present players with new abilities as the story progresses. Quite early on, Fury is forcibly summoned to the Lord of Hollows’ chamber, who grants her the Flame Hollow, which lets Fury change into a fire-infused version of herself, along with adding a secondary weapon and a new traversal option, in this case a fire-propelled high jump. Each of the four attainable Hollows — Flame, Storm, Force, and Stasis — includes a different subweapon type and movement ability, from walking on water to floating through the air. A ranged throwing blade also becomes available later in the game. These extra abilities, while available in combat, require their own upgrades to become as effective as Fury’s whip, and will be primarily put to use to move through levels and solve puzzles. Level design, sadly, is a low point in Darksiders III. Gone are the otherworldly vistas of previous games; almost the entire game takes place on a sundered Earth, with only a few exceptions. Tracking down each of the Deadly Sins requires slogging through laboriously long levels stuffed with enemy encounters and objects to smash. Shortcuts are implemented to frequently open a path back up to a previously-visited section or save point, but other than that layouts are fairly linear. There is no map to reference, but an on-screen tracker does show the path to the nearest Deadly Sin, although the levels’ linearity makes this a rarely, if ever, needed feature. A very long chunk in the early game immediately sends players underground, counteracting the series’ “open-world” design aesthetic. True, the world is interconnected, but with an uninspired glut of locations like subway tunnels, sewers, and warehouses, it doesn’t feel very grandiose. A few highlights include an entire underwater level and a late-game stage which features a deadly tornado that must be avoided at all costs. Levels do feature obstacles requiring the Lord of Hollows’ bestowed abilities, and there are some puzzles that show a lot of creativity on the designers’ part. Once all abilities have been assembled, dungeons can finally throw some interesting challenges at players, the best of which even requiring multiple Hollow forms to overcome; it’s a shame it takes as long as it does to get that far. A Watcher is a girl’s best friend. Keeping in line with its Dark Souls inspirations, combat in Darksiders III is a lot more focused on dodging rather than using a variety of weapons. Players can lock onto enemies, strike with a whip combo, and dodge in any direction with the press of a button. Dodging is awkwardly mapped to the right bumper, without an option to remap the controls, resulting in quite a few cheap hits taken when the traditional dodge button failed to have any effect. In addition to the Barbs of Scorn whip plus the flail, sword, hammer, and dagger subweapons unlocked over the course of the game, Fury also has access to elemental Wrath attacks and can change into a large, impervious beast by triggering Havoc form, both of which require a separate meter become fully charged during combat. Ultimately, though, combat consists of a frantic swinging of the whip with some well-timed dodges and retaliation attacks thrown in until all opposition has been killed. It isn’t particularly deep, but serves up a decent helping of action and challenge nonetheless. Just as her brother War would later receive a Watcher to accompany him, Fury receives her own Watcher to keep tabs on her. The dynamic between the two is generally one of master and servant, with Fury taking on the dominant role. 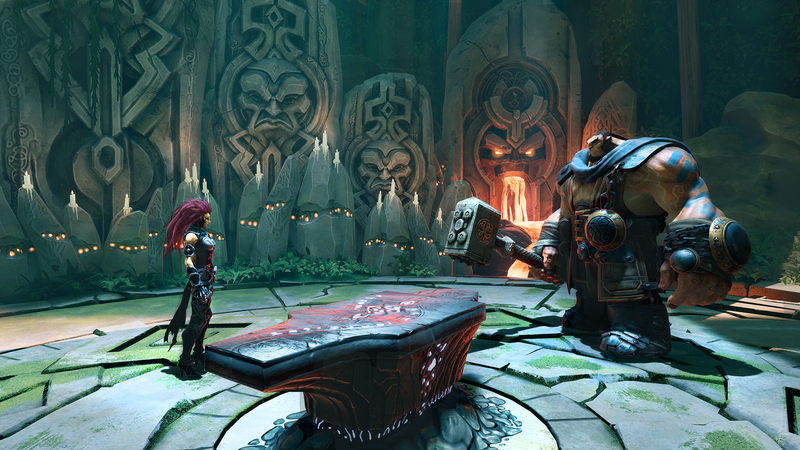 This contrasts with War’s volatile relationship with his Watcher; in Darksiders III, the Watcher is more of a plot device to give Fury someone to bounce off of during the game’s long stretches of solitude. The repartee between the two, however, is well-written and witty, often providing a few chuckles during otherwise tense moments. Their mutual distaste for angels and demons leads to some funny banter, and hearing their absolute disdain for the savage simians called humans really helps to characterize these larger-than-life figures. For the first time, humanity’s role in this divine war is directly addressed. With humanity not quite yet being extinct, a major focus of the game’s story is on what it means to be human and to live the human experience, as characterized by the Seven Sins. One of the game’s few side quests is even centered around saving the last vestiges of humanity; using an item called a Bridge Stone, Fury can instantly teleport any encountered survivors back to a sanctuary built by Ulthain. Apart from this, there is only an optional challenge, posed by the Lord of Hollows, to complete, and a number of Chosen, large boss-like enemies, to dispatch for valuable crafting items. It’s this dearth of worthwhile side content to complete that makes the game feel much more rote than previous entries in the series, and it honestly doesn’t provide much impetus to retread the hackneyed dungeon areas looking for anything that was missed the first time through. In a very surprising move — though there is at least a plot reason for this — Fury is the first Horseman of the Apocalypse who doesn’t have access to her horse at any point during her adventure. To compensate, the world is appropriately scaled down, with Vulgrim still providing his familiar fast-travel mechanic. Boss designs can be, understandably, grotesquely interesting. 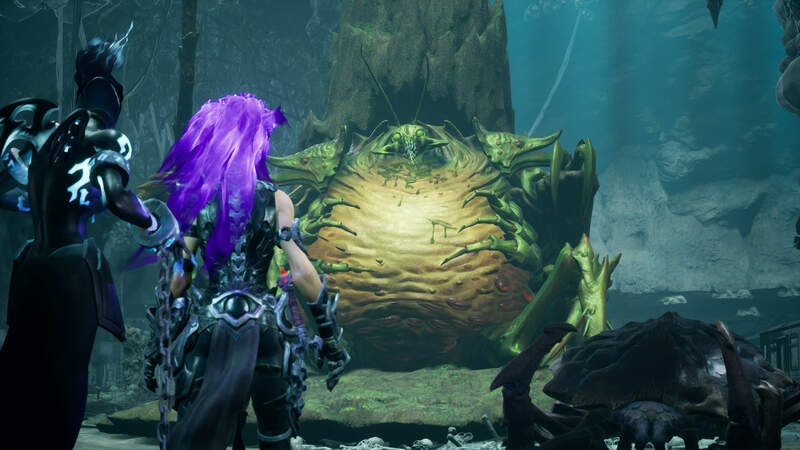 On a graphical level, Darksiders III fits right in with its predecessors. Unfortunately, that means it doesn’t have the noticeable improvement that coming a full console generation later should translate into. It’s not that the game is ugly, but many of the character models could pass for something seen on the Xbox 360 or PlayStation 3. There are quite a few noticeable hiccups present, like awkward mouth movements during dialog, or, worse yet, the game literally freezing up for five to seven seconds mid-movement for mandatory load times when simply moving through the environment. This comes on top of the fairly lengthy load screens each time Fury dies or a fast-travel point is used (though, oddly, falling off a cliff simply resets her, without load time, back to the cliff’s edge). Textures and objects sometimes pop in, even during dialog cinematics, and the framerate visibly chugs at times. A couple of bugs also necessitated restarts during the review playthrough, though these may well have been patched out by release. Though many dungeons suffer from anemic level design, a group of antagonists like the Seven Deadly Sins does offer up plenty of fertile ground for creative enemy designs, which the developers did capitalize on in several cases. Highlights include Sins like Sloth, Gluttony, and Avarice, who are presented as a morbidly obese beetle, a giant octopus monster, and an impish hoarder who throws such projectiles as grandfather clocks, giant rams’ skulls, and the kitchen sink at Fury. Sadly, other Sins take on the tried-and-true “person in gilded armor” look. The game’s voice cast does turn in strong performances as a whole, without any particular standouts or letdowns. The handful of returning characters appear to feature their original voice actors, and the newcomers fit right in with the rest. The music does a fine job of fitting the mood of the different stages, though it too lacks any real heavy hitters that take the player’s breath away. In general, the score’s slower, emotional pieces stood out as more effective, and the theme for the underwater area carried with it a great, thrilling feeling of exploring a perilous unknown. 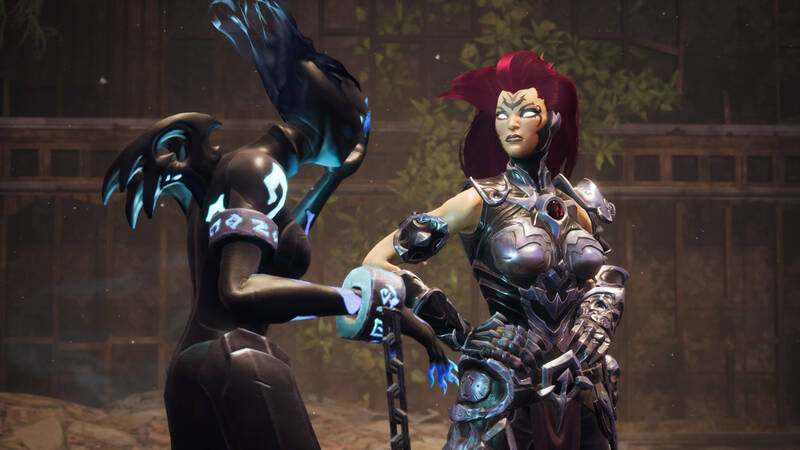 Darksiders III carries with it a lot of expectations, following a near-death experience and six-year absence for the franchise. As such, I wish it resonated with me a little more. It’s a good game on its own merits, but pales just a bit when compared to its forebears; the added Dark Souls combat mechanics aren’t a problem, but what feels like slight moves away from the Zelda-esque puzzle solving and Metroidvania-style exploration are noticeable. In addition, a large amount of underwhelming and lengthy dungeon designs leave the game feeling just the slightest bit watered-down when it’s all said and done. There was a moment as the game’s second half got underway that teased me, for just a moment, with seeing all four Horsemen together and dispensing with the formalities that made up the game’s opening half to get down to serious business. Then the moment ended, and the linear checklist narrative continued. The game may not manage to surpass what has come before, but, if nothing else, it does manage to hold its own and provide series fans with another fun chapter in the series.